Aug 31, 2011 To say the truth, not everybody knows much about geometry. So it can be difficult for many people to give the right answer to rather a simple question, “How many sides does a pentagon1 have?” The word “pentagon” is of Greek origin, and its prefix “penta” (from Greek “pente”) means “five”. If you know this, you can easily answer how many sides there are in a pentagon. If it is a regular pentagon, all its sides are of equal length. The angles of every pentagon amount to 5400. In a regular pentagon, each angle measures 1080. Both shapes on the picture below are pentagons. The first one is regular. There are also other polygons2 with various numbers of sides, and the following table will give you some information about them. All regular polygons have equal sides and equal internal angles. Nature has many examples of such polygons. The most widely-known of them are wax honeycombs in the form of hexagon which bees make for storing honey. The Department of Defense of the United States of America is headquartered in the building called the Pentagon. Its name is so popular that people use it meaning the Department of Defense. 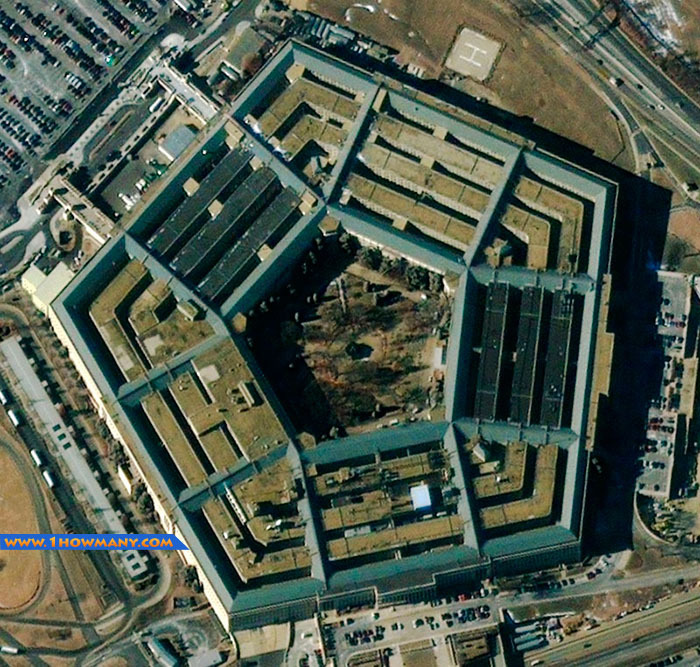 It is not difficult to guess that the building has the shape of a pentagon. It was designed by George Bergstrom, the American architect, and John McShain became the general contractor. The Pentagon was dedicated on the 15th of January, 1943. Now the Pentagon, situated in Arlington County, Virginia, is the largest office building in the world. Its floor area is about 604 000 square meters, and about 344 000 square meters are used for offices. More than 25 000 employees work in the Pentagon. The vast majority of them are the military, though there are also civilian workers and support personnel. The building of the Pentagon has five floors and two basement levels. Every floor has five corridors. The total length of the corridors adds up to 28.2 kilometers. The central plaza also has the shape of a pentagon. Its area is equal to approximately 20 000 square meters. The plaza is informally called “ground zero”. This nickname came into being in the times of the Cold War. It was supposed that in a possible nuclear war the USSR would target a nuclear missile at the plaza. It is interesting that the Pentagon’s groundbreaking was on September 11, 1941, and exactly sixty years later the hijacked airplane was crashed into its territory. This act of terrorism killed 189 people: 59 persons aboard, 125 employees, and 5 hijackers. If you ever forget how many sides a pentagon has, just try and remember what the Pentagon looks like. It will be a good tip for you. A pentagon (from Greek word “pente”, which means “five”) is a five-sided polygon. A self-intersecting form of a pentagon is a pentagram. A polygon (from Greek words “polus”, which means “many”, and “gonia”, which means “angle”) is a two-dimensional shape, made of several straight lines, which are all connected up. The Pentagon is the building where the headquarters of the Department of Defense of the United States of America is located. This name is widely used for denoting the Department.